Our fully air conditioned condo comprising of an open plan living and kitchen/dining area, 2 double bedrooms, one with en-suite facilities and a guest bathroom with full bath and shower, is available for year round rental. The condo is close to many of America's best beaches, including the lively beaches of Clearwater and St Pete's and the quieter beaches of Honeymoon Island, Howard Park and Caladesi Island. There are numerous quality but reasonably priced golf courses in the area within a short drive. The major theme parks of Orlando are just 90 minutes drive away however close by is Busch Gardens and Adventure Island Water Park. The shared heated pool and sun deck is located approximately 100 yards from the condo and provides an area to relax and enjoy the year round sunshine that Florida has to offer. Within walking distance there are supermarkets, restaurants, a pharmacy, a friendly local bar and a 24 multi-screen cinema complex. Larger shopping malls are within 20-30 min drive. Was disappointed that I could not afford a place on the water this year, but very happy with this condo. Super close to the beaches and shops. Everything was clean and the condo was packed with everything we needed. I would visit again. The only issue we had is knowing exactly where the main entrance was to get into the gated community. Bruce helped us quickly and we finally figured out the main entrance is off Tampa Road and not the back way that the GPS took us. Love this place. It is always so neat and clean. The owners are so nice. This condo is our first choice when we come to Florida. Very nice stay and visit, only one small issue already addressed directly with the owners. My wife and I have had numerous holidays in Florida, with the intention of enjoying the weather and playing golf. We were not disappointed. The apartment is in an area that was ideal for our purpose and we were delighted to find that we could safely walk to a good selection of shops including supermarkets, takeaways and eating places. Apart from the golf courses on the site, we enjoyed playing other courses within a few miles. Beaches were within easy reach, beautiful and fairly quiet during the week. Shopping malls were relatively close as were nature reserves so we were never short of something to do. There was also a lovely pool close by, perfect! The apartment was clean, comfortable and very well equipped, playing a huge part in a very enjoyable and memorable holiday. Thank you to Grant and Tricia. 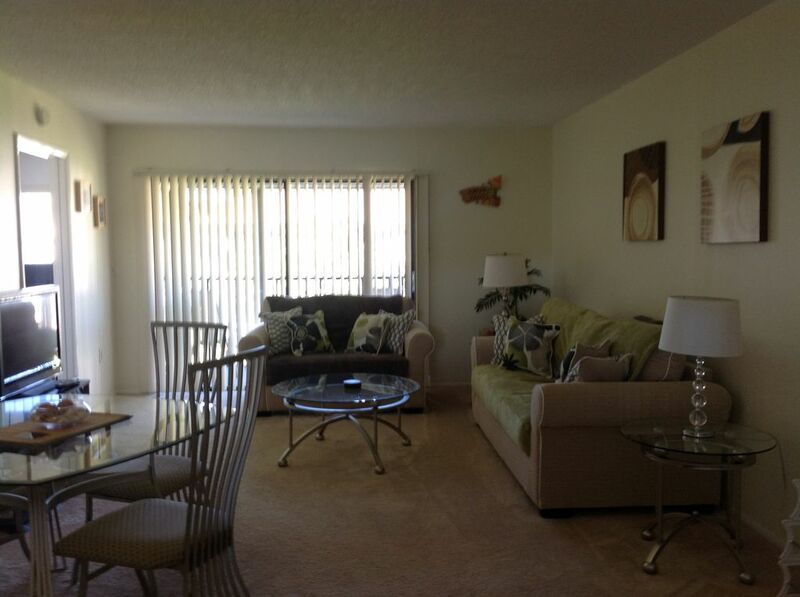 Our apartment is located at the top of Tampa Bay just north of Clearwater Beach in Oldsmar. Clearwater and St Pete's beaches are just 20 mins drive, however the quieter beaches of Fred Howard Park, Honeymoon Island and the locals favorite, Caladesi Island are only a short drive. Join in the endless activities for young and old or relax by the pool and recharge your batteries. You can golf of one of the many local courses, walk , jog or cycle the Pinellas Trail or through John Chesnut Park. For those who like to watch rather than participate the Tampa Bay Buccs play NFL football at the Raymond James Stadium, the Tampa Bay Lightening play NHL hockey at St Pete's Times Forum and Tampa Bay Rays play MLB baseball at Tropicana Field.